Learning Science, Technology, Engineering, and Math doesn’t have to be expensive. In fact, we’ve made a Dollar Store Stem Kit using only items we found at the dollar store. Here is a list of materials we included. A fun project for parents AND teachers to make. Best for preschool – grade school kids. I’m affiliate linking these STEM materials to similar products on Amazon in case you are a Prime addict like me =) and prefer the supplies delivered to your door. The items pictured were purchased at our local dollar store and used by my own children. 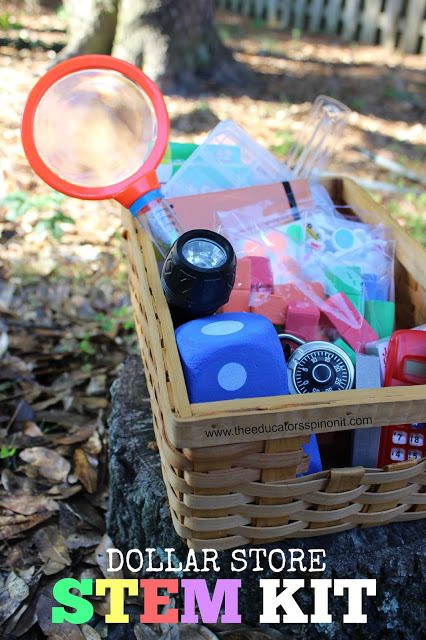 So far, the dice, magnifying glass, and garage sale dots have been the most used items. My 5 year old priced every single toy in our house (and my kitchen supplies) one afternoon and had a pretend garage sale. It was super cute, but we need to re-stock more stickers as they are a one-time use STEM item. For less than $20.00, we have been building, exploring, counting, adding, and much, much more! 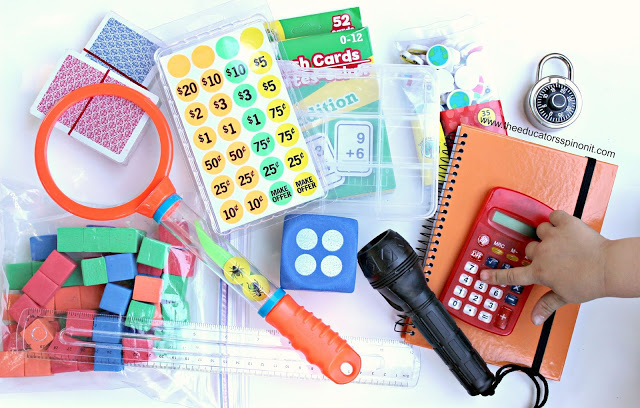 We set out our Dollar Store Stem Kit on the math and science table for the kids to use. We have found that this kit encourages exploration in science, math, technology and engineering in an open ended format. My first grader goes through the stickers, tagging every toy he owns, then charges his sister the price to play with them. My 10 year old has privitised the calculator to “double check” her math problems. And my almost 4 year old loves playing card games. We’re teaching him how to sort and match the numbers with games like crazy 8 and Go Fish.
. Click the title or image below for more details. I love the idea of this post! "FuN" learning doesn't have to be expensive! Do you sell this book in a paper copy? I teach a preschool science class and would love a copy but don't have a kindle. Thanks Jamie for asking! At this time we don't, but the Kindle version works on any device. I can read mine on my desktop at home.